Yesterday I went exploring on the south side of Olsen Creek to see if there was any potential for a new “shoulder season” hike. 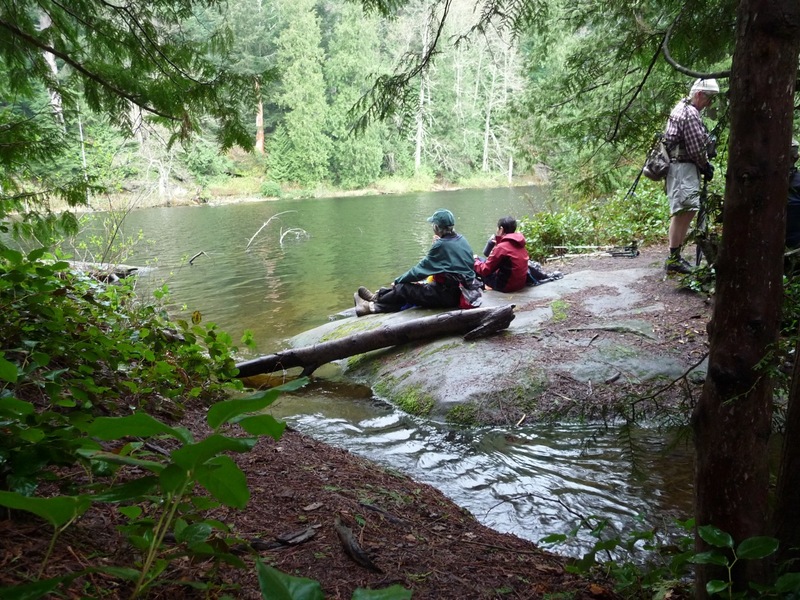 The hike we do most often is on the north side of the creek and goes to a point near the northern summit of Stewart, but on the western side of the ridge where there is no view of the big mountains. 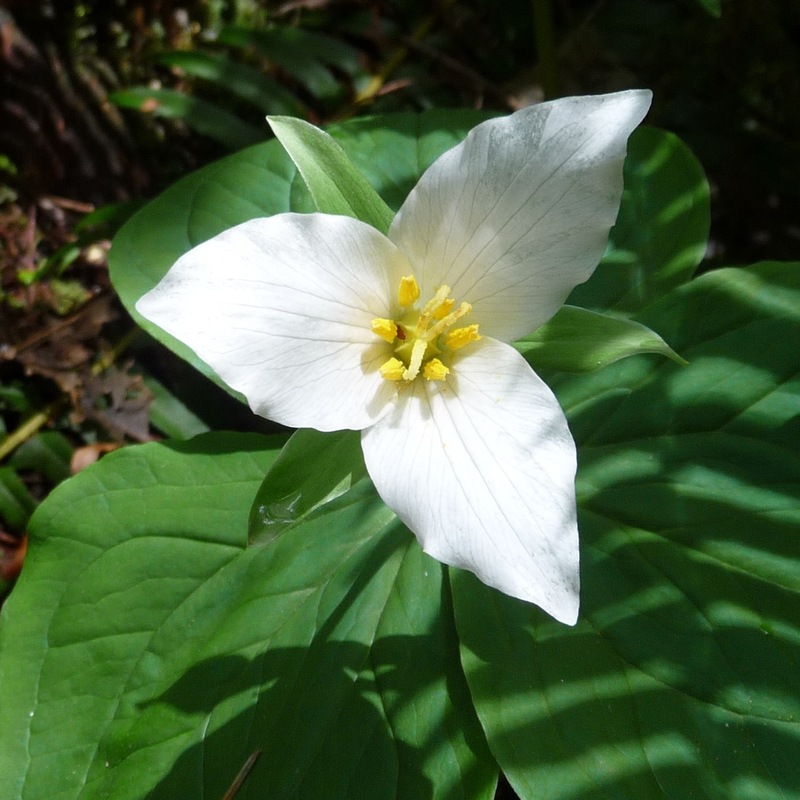 We hike for a couple of miles on a logging road and then another couple of miles on a decommissioned road/trail that is steep in places and can be very muddy, or even submerged, especially in the spring. It had been a number of years since I’d ventured over to the south side. We had planned to go over there once last year, but when we got to the decisive fork on the road we could hear and see that there was some heavy logging activity that was best avoided. About a half mile from the trailhead there is a woodland trail that bypasses some of the road, but it is accessed by fording the creek and the water was just a bit high for me – I was wearing new boots that were advertised to be waterproof but I didn’t want to jeopardize the whole day. Maybe I would come that way on the way back. So I headed on up the road, taking the fork over the steel bridge and up fairly steeply for a couple of miles and 1000′ of elevation. 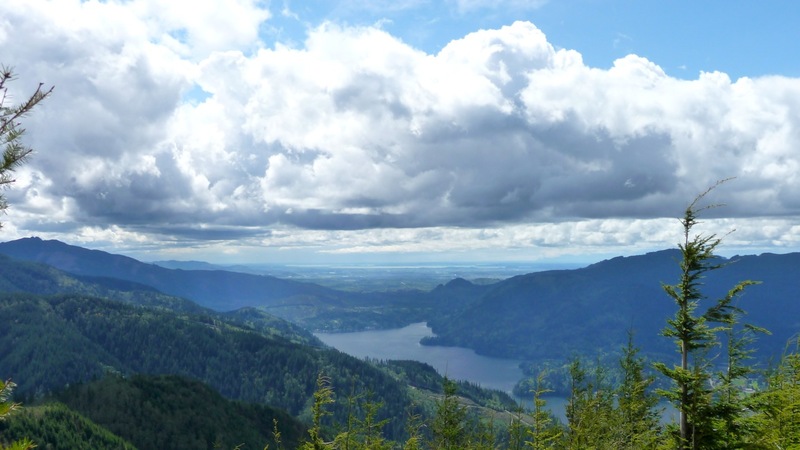 The recent clear-cutting had opened up some nice views of the north end of Lake Whatcom and the San Juan Islands, the only benefit anyone without a logging truck gains from this scabrous “forestry” practice. Someone once told me that there was a trail somewhere here on the south side of the creek that went north, crossed the creek and joined up with our familiar trail on the north side; one time Jerry had pointed out the junction to me. I didn’t have a lot of hope of finding those old trails, but there was a small, new track leading leading on from the end of the road toward the woods, where a couple of bits of flagging tape were visible. When I got there I found a fairly well established trail. Just a few yards further the trail broadened out into what had to be a very old roadway. While I was studying my GPS and deciding whether to continue, I happened to look up and see tacked to a tree a small wooden sign with an arrow pointing east: “Ogallala 1,450 miles”. Aside from the obvious indication that somewhere in Whatcom County there is an expatriate Nebraskan with a wood burning kit, this meant that I was back on the old trail: I remembered seeing this sign years ago. (I didn’t remember the details, but I did remember finding a strange “Wall Drug” sort of sign out in the middle of the woods.) Thus I knew I was on some sort of trail, and one that had a chance of looping back to the north across the creek. So I decided to forge on until the trail became hard to follow or until noon or until I’d gone 5 miles, whichever came first. For quite a while the trail was more or less level, staying between 1550′ and 1650′, rather muddy and a bit overgrown in low spots (there are horse trails, after all), but easy to follow. Sometimes the trail seemed to be on an old roadbed – there is even a quaint wooden footbridge over a stream where there may have been a vehicle bridge once. The only problem was that the track was heading relentlessly to the southeast, getting further and further from the destination I was hoping for. And just past that bridge the trail started climbing. Since the place where the trail would cross the creek would have to be at about 1600′, the climbing wasn’t a good sign either. But soon the trail turned back toward the north for a good distance, bringing me within about of mile of the north side trail. But then it turned back to the southeast again, and climbed, and back to the north, and back, and up, and I was giving up. At a couple of these turns it looked as if there might be a track to the north, but I was getting tired and certainly not interested in getting into any bushwhacking. By this time the trail was clearly on an old roadbed with the occasional grove of alders, very easy walking and very bright and sunny. I was nowhere near my five mile limit, but I noticed that it was after 12:30. I found a friendly log and stopped to eat, a bit puzzled that I was so tired and that four hours had gone by. (I didn’t realize until much later that the odometer of my Garmin GPSmap 60CSx was back to its old tricks – after I got home I found that I had gone well over 5 miles.) As I sat there and puzzled things out I realized that I had gone quite a bit further east than expected, and the sunniness probably meant that I was right up on top of the mountain, near the ridgeline. Since I was still paying more attention to my GPS than to my body, I headed on along the roadbed toward the north. My topo maps showed a lot of old roads up here near the ridge, even connecting back to the summit of our usual hike. The track was nearly level and very open so maybe I could make it all the way back there and come down the new trails on the north side of the creek. But I had gone just a short way when all at once the roadway was covered with fresh greenery, and rounding a curve, there was a set of big excavators and the sound of engines. I chatted up the drivers, who said that they were doing a lot of road building, but that it was too wet to work, so I would have no problem if I went further up the road. But, being of the petroleum-based sort, they couldn’t tell me much about trails, except that there was something called “Trail #5” somewhere near. Any sensible person would have turned back at this point. Heaven only knows what sort of nastiness a hiker can get into in an active logging operation, and I was probably less than a quarter mile from that viewpoint and from there could follow a nice, safe trail back to the car. But I still was thinking about making a loop, so I decided to go on for a bit on the new road. It was indeed muddy in places, and not a lot of fun, when a I came to a tee in the road. The left branch was newly graded, unsurfaced and headed downhill, in roughly the direction I wanted to go. To the right was an older road, also being rebuilt, probably the old road system I’d seen on my maps. I studied the GPS for awhile and decided that the latter way might be a fairly easy walk, but would be just too darn long, probably 6.5 or 7 miles. It would still make sense to head back the way I’d come (5 miles, or so I thought), but I decided to head down the new road, at least as far as a rock pile that might be the end of it. Or not. I clambered over the rock pile, which appeared to have been recently blasted, and the road continued. It looked like it deteriorated pretty soon, but there were bits of flagging tape going quite a way into the distance. Hoping that this was an old roadbed that connected with the system I’d left hours before, but fully aware that it might come to a sudden end at any moment, I barreled on down. This was pretty stupid. Even allowing for the built-in stupidity of the whole idea of an old fart going off in the woods by himself, much less bushwhacking, this counts as major stupidity. I could still find my way back out the way I came, no matter what, and there was plenty of daylight left, but I was tired. And now reversing course would involve a fair amount of climbing. So this was really stupid. And lucky. The old roadway was soon no wider than a foot trail in spots. Then the roadway was no more, but the flagging continued, down a steep trail. And then there was a fork in the trail and a pair of small signs advertising trails number 5 and 8. I had apparently been on Trail #5 for some time, and it seemed to be heading north and steeply downhill. Trial #8 headed south and uphill – possibly it was the link back to the trail I’s come up on. But I still had a bias toward the north, and my body was shouting “Downhill! Go downhill!”, so #5 it would be. I ended up going about 11.5 miles with 3500′ feet of elevation gain and didn’t get back to the car until almost 4:00, so I’m not about to put this on schedule for the Senior Trailblazers, even though it suits our name better than most hikes. But a fair amount of my time was spent trying out dead ends and being very cautious and watchful, so just going out-and-back to that viewpoint might be manageable on a lovely day. And even if you didn’t get to the viewpoint it is still a nice walk on the woods. 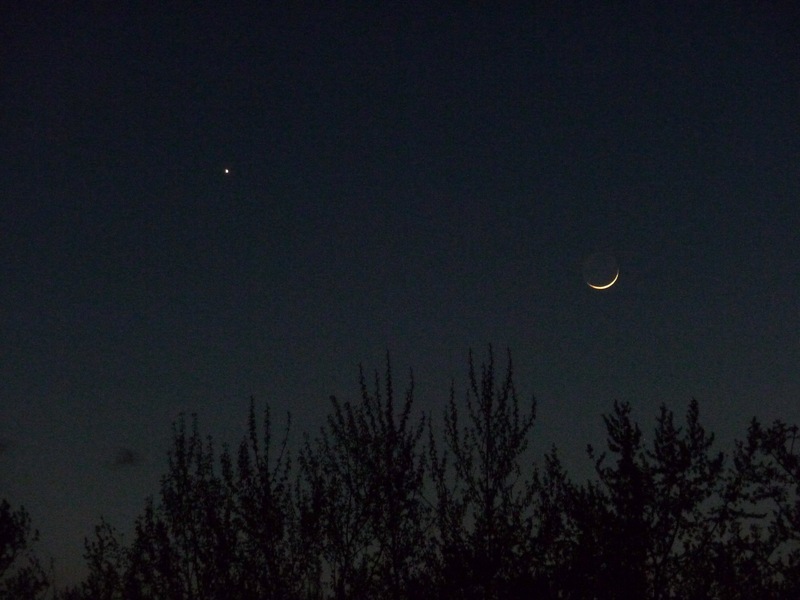 Last night (April 15) i happened to pass by our west-facing patio door just before 9PM and saw that the afternoon clouds had gone, and a delicate, slim crescent moon and a brilliant evening star were the only heavenly bodies visible. I assumed, with hardly any thought, that the evening star was Venus, as usual. At first I managed to simply admire the sight for its own sake, but soon the geek in me revved up and I remembered that I had recently downloaded an iPod App called “Star Walk”. (I usually just get the free ones but I had coughed up the princely sum of $3 for this one after reading a recommendation.) I draws a graphic representation of the sky at any time, night or day, on any date, past or future, potentially replacing a lot of star charts. I had gotten the app on a whim – I’ve had an interest in astronomy, on the most amateur of levels, since I was about ten years old. It would be hard to find a place less nurturant of that pastime: we lived about 13 miles north of downtown Chicago, with all it lights and pollution, and our immediate neighborhood had lots of tall trees (this was before Dutch Elm Disease). If you went down to the shore of Lake Michigan you could get a fine view of the eastern and northern skies, but the south was hopeless. When I was a bit older I would be able travel after dark the two miles to the Dearborn Observatory on the Northwestern University campus, but at first I was limited to my backyard and a small neighborhood park a block away. I still remember how excited I was one June evening when I found my “first” star and constellation. I had learned the really basic things that every kid gets, like the Dippers and the Pole Star, but on this night, after studying my little star chart, I let the curve of the handle of the the Big Dipper lead my eye to the kite-shaped constellation called Boötes and the brilliant gleam of Arcturus, the first magnitude star at the base of the kite’s tail. I can still pick out most of those constellations that are high in the spring and summer skies – anything south of the celestial equator is pretty much a mystery to me, though. Thanks, Chicago. But enough of that. 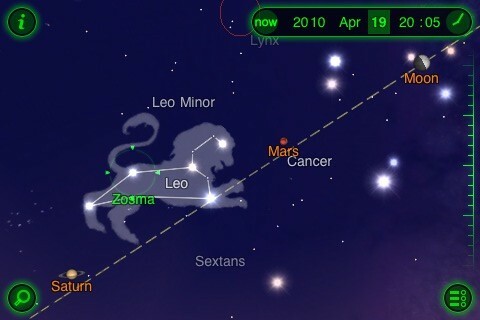 As I looked at the evening display I remembered Star Walk and fetched my iPod. I spun the app around to the west (apparently with an iPhone’s fancy accelerometer and such, that wouldn’t be necessary: it just KNOWS which way you are looking.) 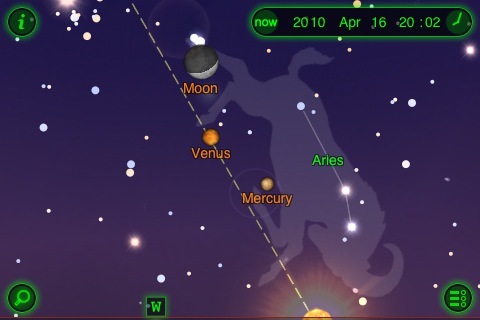 and sure enough, there were icons for Venus and the Moon and OMG that’s Mercury! Mercury is the only one of the planets that can be observed without a telescope that I had never seen. It is a shy little bugger. It is very small, smaller than anything in the solar system except Pluto (which doesn’t really even count as a planet any more, they say) and much, much smaller than Venus; and its orbit is very close to the Sun, which means that it is only above the horizon for a short time just before the Sun rises or just after it sets. And of course at those times the sky is very bright and little Mercury is easily overwhelmed. Not to mention that when we are looking at things which are near the horizon, we are looking sideways through the atmosphere and looking through a lot more clouds and airborne muck and crud than when we are looking directly overhead. I stepped outside and looked as hard as I could but couldn’t see anything but Venus and the Moon. So I fetched my good binoculars and there it was: a tiny but steadily glowing dot just about to drop behind the treetops. (The trees are downhill from our house, so their tops are near the horizon.) I then tried to get a photo, but didn’t think I had time to set up my tripod (just finding it could easily take until sunrise) so I just put my hope in the camera’s image stabilizer. Venus and the Moon showed up pretty nicely, but I didn’t really expect to get a usable picture of Mercury. But this morning I took a little time with iPhoto and adjusted the levels on the sharpest of the pictures and there was a tiny white dot below and a bit to the right of the Moon, right among the treetops. It is possible that the dot is just an artifact of the photo processing software, but it is right where it I remember seeing Mercury, and it has about the right brightness level, compared to that of Venus. You probably can’t see it on the little image to the left, but if you click on it you can see the full size image. If your software setup allows you to view the image at full size (about four times as big as your whole computer screen) you might be able to see it. 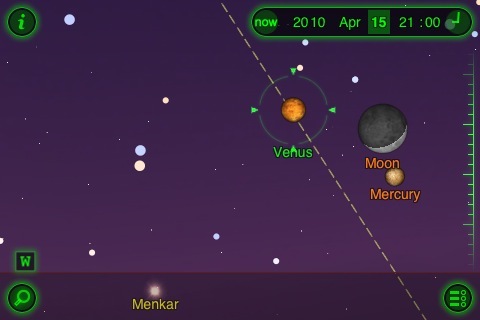 Star Walk shows that the relationship between the Sun, Venus and Mercury will not change very quickly over the next few days. The Moon will quickly scoot up higher above the horizon, getting brighter each day (Boo!) but further away (Yay!) but the planets will move much more slowly. I’m talking about the apparent motion from our point of view – the planets are zipping right along in their orbits but the Moon is so much closer (a quarter million miles away versus about 93 million for Mercury) that it appears to travel proportionately faster. The second screenshot shows the relative positions of the bodies at sunset on Friday. You’ll notice that the Moon has moved quite a bit away from the horizon (after all, it has to get all the way around the sky and back in just 28 days) but the positions of the planets and the Sun haven’t changed much. If we get another clear sunset soon and you have a good set of binoculars, you might get a look at Mercury. And there’s more! If you act now you can see a near planetary grand slam, since all of the visible planets (except Jupiter) are now above the horizon at a civilized time of day. The last Star Walk screenshot shows a view of the southern sky at about sunset on Monday. About midway between the horizon and the zenith, you can see Mars and Saturn on either side of the constellation Leo on a line with the Moon. (Actually Saturn is in Virgo and Mars is in Cancer, but those constellations are rather faint compared to the prominent sickle shape that represents the shoulders and head of the Lion.) There is no rush to see these two, since they are much further away than Venus and Mercury and their apparent motion correspondingly slower. And having the Moon nearby might help you find them: they are very bright and much, much closer than the stars, so the brightness of the Moon will tend to wash out the stars and make these reddish planets stand out even more. But wait! There’s still more! If you want to try for the quintifecta, the full grand slam, just stay up until dawn and move to a view of the eastern horizon (if such a thing exists around here – you may have to climb a mountain) and catch Jupiter playing the Morning Star role, rising just ahead of the Sun. The forecast called for rain last Thursday, but it wasn’t the weather that gave us the most grief. Pat wasn’t able to come and his absence definitely had ramifications, since there was no one on the hike who was really familiar with it. A couple of the hikers had been along before, but no one had ever led it, including yours truly. It is not an officially listed hike in anyone’s book, but we call it “Burnout Road”. 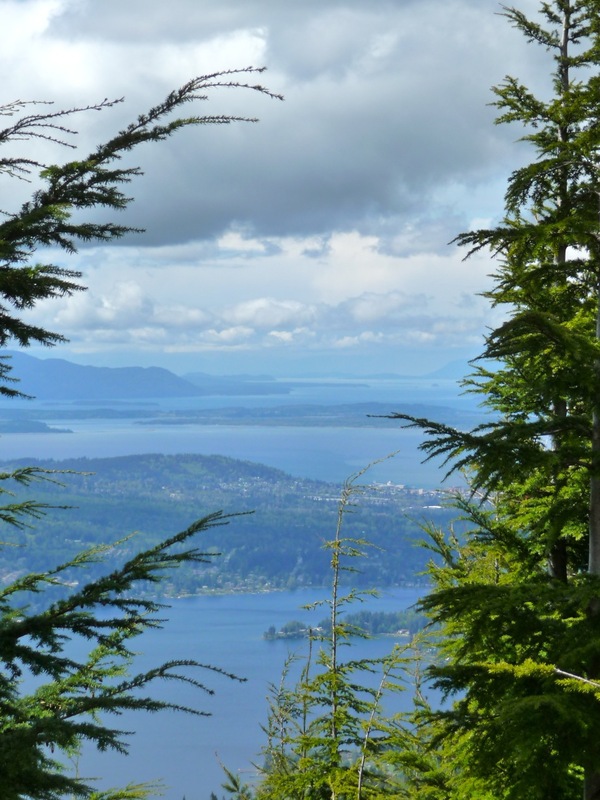 You start up Fragrance Lake Road (from the Clayton Beach trailhead on Chuckanut Drive) and take the fork onto a gated road. Somewhere I saw it labeled as “South Chuckanut Road”, but we will probably keep calling it Burnout Road forever. At the end of the road there is a “Y” – the left fork looks like an abandoned road and the right one turns into a trail. My understanding was that we should follow the trail and we would join up with another (unofficial and unmarked) trail that we used in January to go around Lost Lake. But this time we were to turn left and go back towards Fragrance Lake Road, making for a hike of about 8 miles. We started down the trail, which descended very, very steeply, dropping 500 feet in less than half a mile. That morning I had quickly installed in my GPS some waypoints from the previous Lost Lake hike, so I knew basically where we wanted to get to, but only “as the crow flies”. That was of limited use, however, since we didn’t have any crows along with us. I had my eyes peeled for a trail going off to the left, but didn’t see one – there was one little disturbance to the side of the trail at one point, but otherwise nothing. After a while the trail flattened and widened, following an old road bed. I was already getting suspicious that we’d gone too far when we came a junction that looked familiar – normally “familiar” is a good thing, but not so much when you’ve never been on the hike before! But there are things that “look familiar” in these woods, and going back the way we’d come did not appeal (remember that very, very steep trail we’d come down?). Worse comes to worst, we would end up at Lost Lake, making the hike quite a bit longer than we’d planned. I had pretty much kept my concerns to myself, but when we came over a little rise and I looked down on a good-sized lake, it was clear that Worse had indeed come to Worst, so I stopped and announced our situation to the group. At this point there was no real choice except to press on, even though that meant going all the way around Lost Lake, which could easily have been named Long Lake, since it is very, very long. The choice was then between going on around a very, very long lake of backtracking up a very, very steep hill, so on we went. We ended up covering 11.5 miles with about 3000 feet of elevation gain – quite a bit more than planned, but as usual there were no complaints. We’d had a nice lunch break by the lake and it was even sunny by the time we got back to the cars. When I got home and connected the GPS up to the computer I found that we should have found that trail junction after we’d gone only about half way down the very, very steep hill. (Maybe that little aberration in the side of the trail was the real deal.) And I had, in my haste, loaded the waypoints from an earlier hike to Lost Lake that took another trail, so my distance estimates were a bit askew the whole time. Sigh.